With a dominant victory on the streets of St. Petersburg, TeamNL driver Rinus VeeKay has made an impressive debut in the Indy Lights Championship Presented by Cooper Tires. After a solid top-five finish in the first race of the weekend, the 18-year-old driver from Hoofddorp in the Netherland stormed to the lead in the opening lap of race two, to claim a dominant victory. “I’m so happy and it’s a great way to start this championship campaign,” said an ecstatic VeeKay. 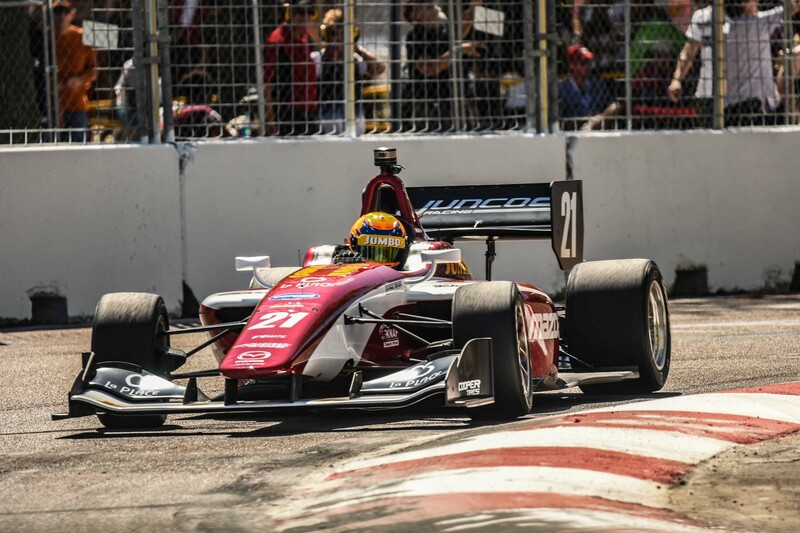 This season TeamNL driver and reigning Indy Pro 2000 champion Rinus VeeKay stepped up to the final step of the Road To Indy ladder to debut in the Indy Lights Championship Presented by Cooper Tires. This weekend the 1.8-mile, 14-turn street circuit of St. Petersburg was host to the opening round of the championship. The 2019 Indy Lights Presented by Cooper Tires comprises 18 races at 10 tracks, from ovals and road courses to street course venues. The 18-year-old driver from Hoofddorp in the Netherlands has good memories of the street course in Florida. Making his debut in the Indy Pro 2000 Championship VeeKay claimed both victories in the opening round of that series one year ago. But in practice VeeKay suffered some electrical problems with his car and the first qualifying session was also far from trouble free for the Juncos Racing driver. His second set of tires caused some understeer and VeeKay was not able to defend his top three position and dropped back into sixth position. In the second qualifying session the TeamNL driver proved his real speed and claimed the second position, only 0.08-seconds short of the pole position. With his quick lap times from second qualifying in mind, VeeKay had high hopes that, starting from sixth position on the grid, he would be able to gain some positions during the 35-lap race. With a great start VeeKay was fourth after the first lap, but dropped one position in the next lap. In the first part of the race his car didn’t have the pace to keep up with the top four and the Juncos Racing driver even had to defend his fifth position. But in the second part of the race VeeKay was able to improve his lap times. He closed the gap to the driver in front of him and drove away from the number six. After 35 laps VeeKay crossed the finish line in fifth position, scoring his first points in the Indy Lights category. In the second race VeeKay made loud and clear what his goals for this season are and why he is the reigning Indy Pro 2000 and Formula 3 Asian Winter Series champion. Starting from second position on the grid, the Juncos Racing driver had a great battle with pole sitter Oliver Askew, took over the lead in the opening lap of the race and immediately stretched his lead to three seconds. This advantage remained constant for a long period, but after lap 25 the gap suddenly increased to almost seven seconds. After a crash of one of the other competitors on lap 33, the safety car was deployed and VeeKay’s advantage was gone. However, with only four laps of the 40-lap race to go, the race was restarted and VeeKay proved his great form again by claiming his first Indy Lights win in his debut weekend with a margin of 0.6 seconds. “This feels so great, especially after that fifth place in race one, although that was not so bad at all. But that’s not what we are aiming for and with this win I accomplished my goal for this weekend. We learned a lot from race one and it all worked out in the second race. We made some adjustment to the set-up of the car and I used the tires much better than I did in the first race of the weekend. This gives a lot of confidence for the rest of the championship,” said a very happy VeeKay. In the championship standing VeeKay is in second position now, only nine points short of the leader. Within two weeks the Formula 1 Grand Prix track Circuit of The Americas in Austin is host to round number two of the Indy Lights Championship Presented by Cooper Tires. This season, Rinus VeeKay is supported by Jumbo, La Place, Mazda Motorsports USA and the TeamNL/KNAF Talent First program.